Every minute you’re outside, you’re likely inhaling hundreds of “bioaerosols” — pollens, spores, microbes, and other tiny objects that can cause allergic reactions. Today’s best method for measuring that allergen load is decidedly low-tech — researchers catch bioaerosols in filters or spore traps and study them under a microscope to identify each one. But a new gadget, hacked together by UCLA researchers, uses machine learning to dramatically speed up that process. Eventually, it might even give you a better sense of the air you’re breathing. The UCLA researchers describe their device, which they built for less than $200 in parts, in a new paper published in the journal ACS Photonics. Basically, the apparatus catches bioaerosols on a sticky surface and scans them with a laser and a small sensor. 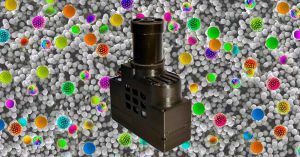 Then it feeds the resulting image into a neural network trained to recognize common allergens such as oak, ragweed pollen, and certain mold spores. Finally, it tells you exactly what’s making you sneeze. Though promising, the UCLA prototype isn’t quite ready for action. Its algorithm can only recognize five allergens, and its accuracy is a good-not-great 94 percent. But incremental improvements could result in a compelling gadget that would let you analyze the air around you — and maybe decide whether it’s time to pop an antihistamine.